VRC concentrator | KATSURAGI INDUSTORY CO.,LTD.- Dryers,Drum Flakers,Concentrators,Crystllizers. Heater is of vertical tube type, boiling and agitating the liquid in the tube with the heat source (steam, hot water, etc.) outside the tube. The liquid flows upwards with the vapor generated strikes against the upper baffle board, and non-evaporated liquid returns into the heater through outside the return line and circulation pump. The upflow by boiling and agitating not only prevents dirt and scale adhesion by its intense boiling phenomenon but also maintains a high heat-transfer coefficient. 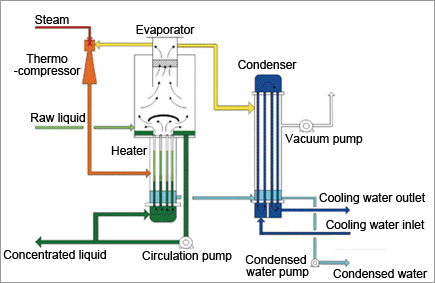 This system is of a simple and compact structure and its evaporator’s height is controlled at low level. 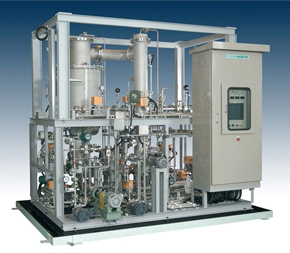 This is suited for evaporation and concentration of general wastewater and desalination system.